First boil the syrup ingredients in a pot. Then simmer for 10 or 15 minutes to have a better thickness. Turn the heat off and leave the syrup to be cold. For twisted,lay down 2 sheets one over the other and spread the 1,5 tbsp liquid oil over the sheets. 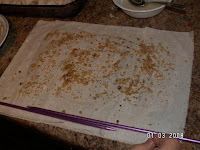 Sprinkle the walnut to every place of the sheets. 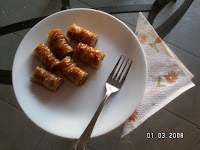 Hold the peaks of the knitting needles near as in the picture and place them to the edge of the Phyllo. 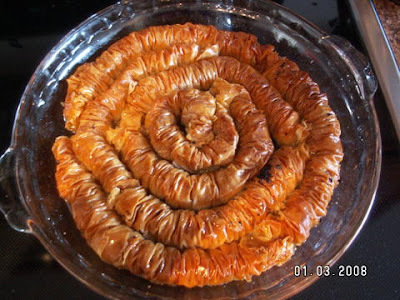 Roll the Phyllo slack .Shirr from two sides through the middle .Take off the knitting needles and place twisteds to the oven tray. Fill all the tray like that. Pour melted butter over the twisted. Be careful not to pour the dregs of the butter. Bake it at 330F until the color of the dough becomes brownish. Pour the syrup onto the hot twisted that just cooked. Serve cold.